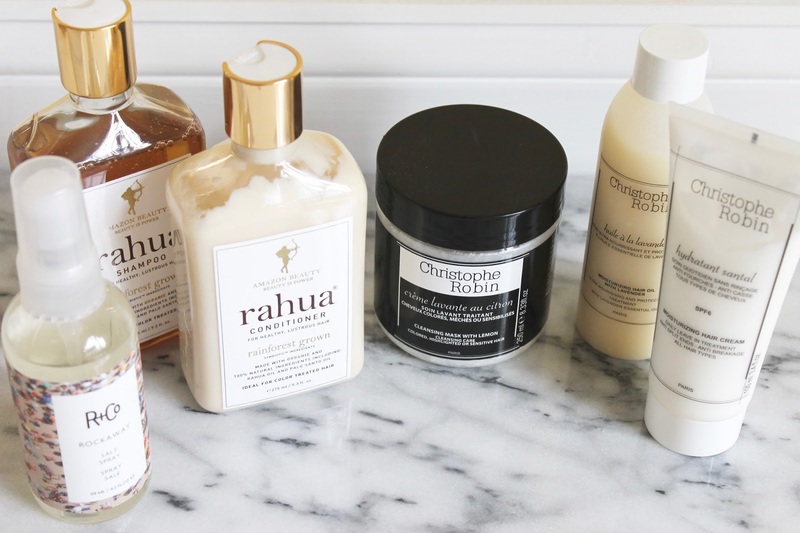 Rahua Shampoo and Conditioner - I'm not too loyal when it comes to shampoo and conditioner, but I do look for a pair that creates some volume and doesn't weigh things down. I was pleasantly surprised by how light, swishy, and clean this all natural (even vegan) duo left my hair feeling. I've been using it for about two weeks now and even through numerous heat styling episodes, my hair has managed to feel strong and healthy and I have no noticeable split ends. The scent is perfectly invigorating for slow mornings and I love how the conditioner seems to absorb into my hair when applied - not sit on top. No exaggerations here - styling seems to become easier, and my hair feels nourished and bouncy...not flat and heavy. 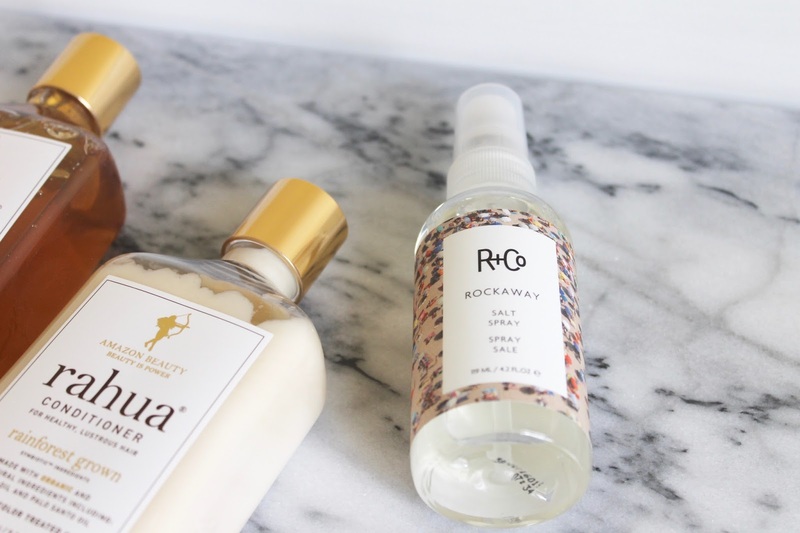 R & Co Rockaway Salt Spray - You know I love a good salt spray, so when my go-to Sachajuan Ocean Mist was on it's last leg I picked this adorable bottle up in SpaceNK on recommendation and decided to give it a spin. It smells dreamy (like fig and amber - not salt) and I love the packaging, but it's what's inside that counts. This volume-inducing mist cuts out the dreaded "I cant run my fingers through my hair" feel we all get when using certain salt sprays. I'm used to sacrificing textural appearance for a slightly ratty feel but with this one I don't have to. It adds a hint of bend I didn't know my hair had and gives a tousled, volumized look while still maintaining a soft, swishy hair feel. Win. 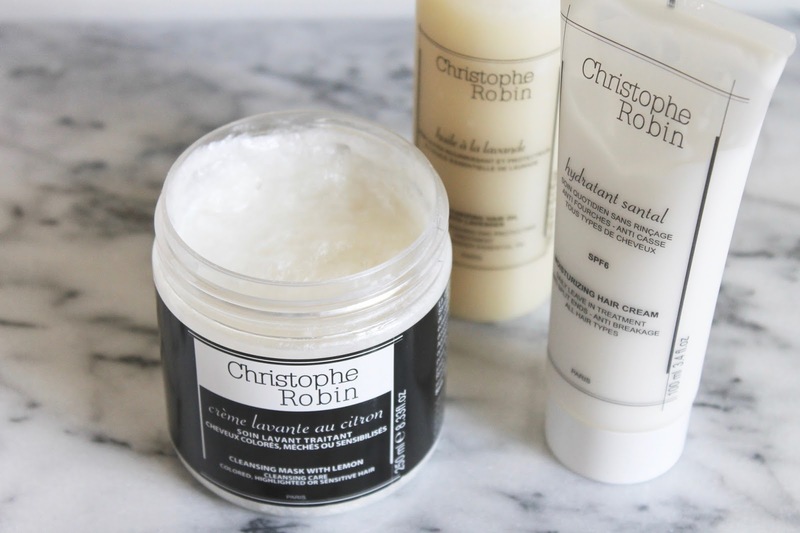 Christophe Robin Cleansing Mask with Lemon - While it's nice to use said texturizing products to style your hair, buildup can often be a problem. That's where this deep cleansing mask comes in to play. It smells like lemon, is safe for all chemically treated hair, and will give your hair a volume boost after it wipes out all the product buildup at your roots. The application is also truly unique and a dream to use. Just apply it to the hair and leave it on for anywhere from 5-20 minutes (depending on how deep of a clean you need). When it comes time to rinse, you slowly add water and work it into a foamy lather while scrubbing away before doing so. Once your hair dries, you'll be left with shiny, bouncy hair and a clean fresh start for styling. Christophe Moisturizing Hair Cream - So many hair creams tend to feel sticky when applied - but don't write this one off for that same reason. Think of this as you do your favorite lightweight moisturizer - it sinks in on contact and leaves things feeling hydrated, soft...and you, with an overall better canvas. No matter what style I'm going with, I can run a bit of this through my mid-lengths and ends to add a bit of definition and tame frizz, while adding back moisture lost to heat styling. Christophe Robin Moisturizing Hair Oil with Lavender - Hair oil is something I've always relied on to tame flyaways and keep my ends healthy (applying it anywhere near my roots is a big no no), but it's not always so easy to find one that absorbs completely. This oil comes in a solid form (like coconut oil) and will turn into an oil when it's run under warm water. Just a few drops helps protect the hair during heat styling and adds a certain manageable slip to ends. I love how you can't feel any oil residue, so much so, that I can even use a small amount of this to add shine near my roots - which is nothing short of a hair miracle.